The Mahabharata is one of the two major Sanskrit epics of ancient India. It is an epic narrative of the Kurukshetra War and the fates of the Kauravas and the Pandava princes as well as containing philosophical and devotional material, such as a discussion of the four goals of life. Here we have Mausala Parva, the sixteenth, in which Krishna and Balarama die, the Yadavas are destroyed, the Yadava women mourne their dead husbands and Dwaraka, the city of Krishna, is submerged in the sea. Vyasa is a revered figure in Hindu traditions. He is a kala-Avatar or part-incarnation of God Vishnu. 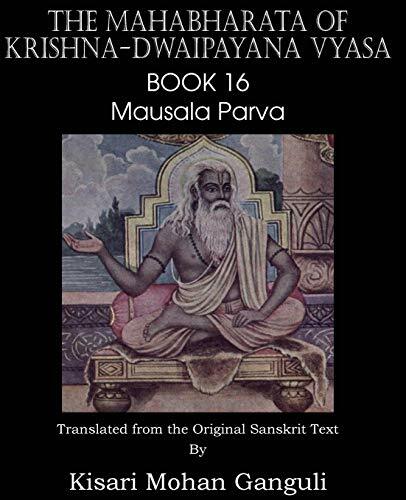 Vyasa is sometimes conflated by some Vaishnavas with Badarayana, the compiler of the Vedanta Sutras and considered to be one of the seven Chiranjivins. He is also the fourth member of the Rishi Parampara of the Advaita Guru Parampar&#x101; of which Adi Shankara is the chief proponent.